← Tally Ho! Which local newspapers published election tallies this year? There was some good news for Fianna Fail at last weekend’s elections; emerging as the largest party at a local authority level in the state (with 266 seats) and faring especially well in certain parts of the state. However, party support levels remained weak in other parts of the state, the party failed to win seats at either of the two by-elections and the European Elections contests proved to be a significant disappointment. Fianna Fail won only one seat at the European Elections, down from the three seats they won in 2009, with party vote magnet, Brian Crowley, proving to be the only successful candidate here. 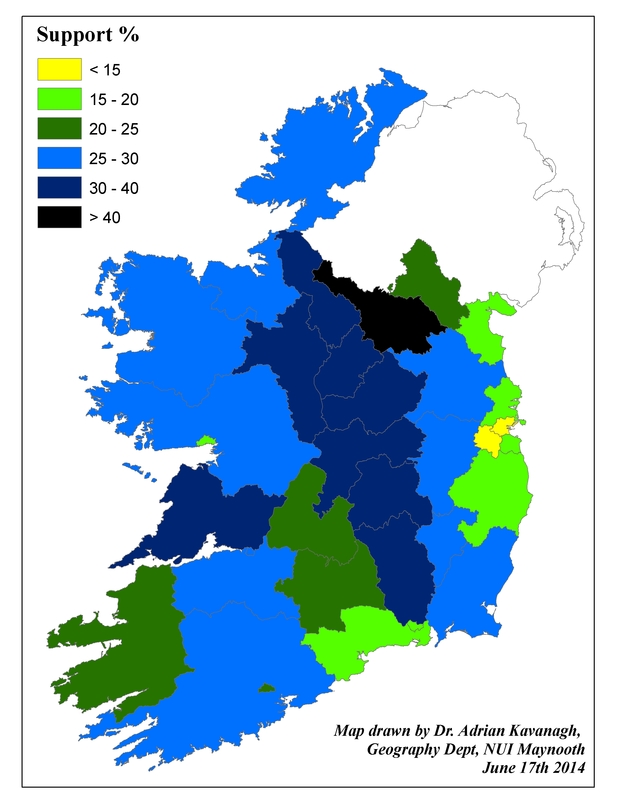 In two of these constituencies, Dublin and Midlands-North-West, the party vote was notably lower at the European contest than it was at the local elections contests within those same regions, but most notably so in the Midlands-North-West region (see Figure 2 below). The party vote was higher in the European contest in South than it was in the local election contests across that region, but this probably could be put down to the Crowley factor. As it transpired, Fianna Fail (32.0%) won a much higher share of the vote than Fine Gael (27.8%) did here, but a very unbalanced share out of the party vote (with Crowley taking 85.7% of the Fianna Fail vote in that constituency – indeed Brian Crowley accounted for 48.8% of the total Fianna Fail European Election vote across the state on May 23rd) meant they only won the Crowley seat there while Fine Gael took two. The failure to win a seat in Midlands-North-West was blamed by some commentators on the decision to run two candidates there, but the issue here simply was that the party did not win enough votes, winning just 17.8% of the vote here – a one candidate strategy would have left the party on a smaller share of that vote with no major transfers to come to a party candidate. (And there was a very significant transfer from Thomas Byrne to Pat The Cope Gallagher here.) And Fine Gael’s success in South with three candidates also suggested that the “running too many candidates” argument did not hold too much water. A simple lack of votes was also the root cause of the party’s failure to take a seat in Dublin, although Mary Fitzpatrick was in third pace on the first count there. That being said, just as with presidential elections, European contests are ultimately personality contests and the “real meat” at last weekend’s elections concerned the local election contests, at which Fianna Fail fared notably better. 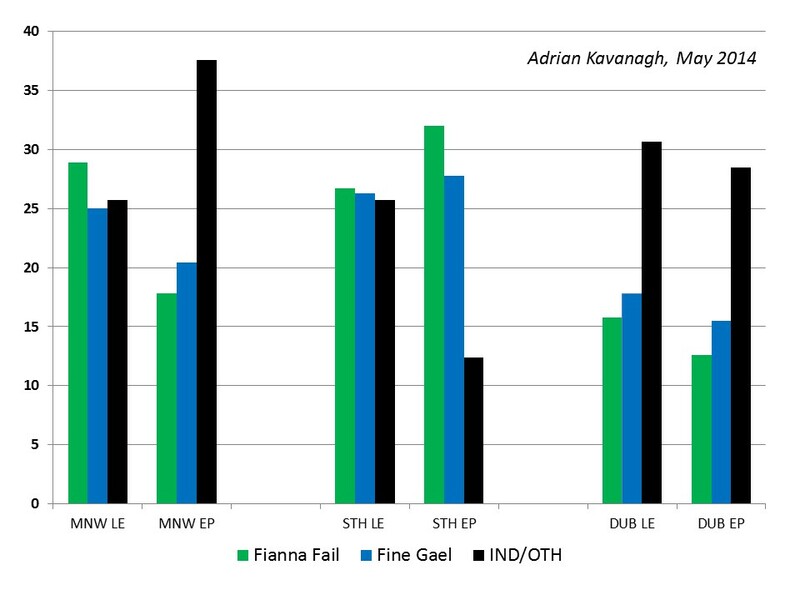 Figure 2: Votes for Fianna Fail, Fine Gael and Independents/Others by region for both the 2014 Local Elections and 2014 European Elections. While the party’s two by-election candidates, David McGuinness (Dublin West) and Aengus O’Rourke (Longford-Westmeath), fared respectably at the two by-elections, with both making it to the final count, Fianna Fail ultimately never looked that they would win either of these contests at any stage of the counts. The party vote share in both constituencies would leave them well poised admittedly to win one seat in both of them, as happened at the 2011 General Election, although the number of first preference votes won in Dublin West fell from 7,742 to 5,053 between the 2011 and 2014 by-election contests. Fianna Fail won 25.3% of the national share of the vote at the 2014 Local Elections. This actually was 0.07% lower than the party’s vote share at the 2009 elections but this trend can simply be explained by the party’s significantly lower number of candidates, especially in relation to the massive increase in candidates associated with the Independents and Others grouping between 2009 and 2014. The party’s share of the vote was notably higher than that recorded by it at most of the pre-contest opinion polls (and indeed the level of support estimated for it at these contests by the RTE Exit Poll).Their number of seats increased by almost fifty – and this will probably amount to an increase of fifty once the Ballybay-Clones results are factored in – to 266 from 218 at the 2009 elections. There may have been even more gains for the party had their candidate selection process proven to be less acrimonious, as a number of “selection defections” – Fianna Fail people who ran as independents after losing out at party conventions and/or failing to be added to party tickets by Party Headquarters – went on to win seat at the Council elections, including Emmet O’Brien (Adare-Rathkeale), Brendan Phelan (Borris in Ossory-Mountmellick), Nick Killian (Ratoath) and Mary Linehan Foley (East Cork). 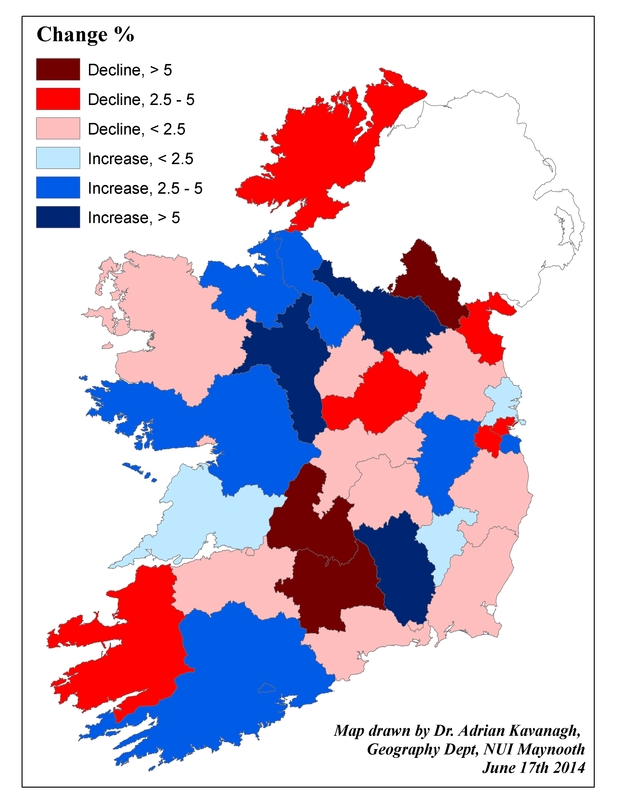 As the map above shows (Figure 1), there was a strong geographical trend evident in relation to Fianna Fail support at these elections, with the party faring especially well in certain parts of the state, but most obviously in a large area stretching down through the Border and Midlands regions from Letrim and Cavan in the north-west to Kilkenny in the south-east, with Clare emerging as a notable outlier to this particular concentration of higher Fianna Fail support. The party’s highest vote share at a county level was won in Cavan (40.6%), boding well for the retention of the party’s Cavan-based seat at the next general election (despite the reduction in Cavan-Monaghan’s seat numbers). At the electoral area level, Fianna Fail won over 40% of the vote in four constituencies – Bailieborough-Cootehill (49.9%), Arklow (46.2%), Fermoy (43.3%) and Kilkenny City-West (43.1%). In almost a more dramatic vein, they managed to translate a 38.4% vote share into five seats out of eight in the Ballymote-Tobercurry electoral area (winning five times the number of seats won by Fine Gael, despite only winning 1.4 times that party’s number votes in that electoral area. Fianna Fail fared less well in Dublin than in the other regions and the party is well off regaining the catch-all support patterns that marked it in the heyday of Bertie Ahern’s period in power. (The party also did not fare well in Louth, Waterford and Galway City, where it failed to win more than one in every five of the votes being cast across those local authority areas.) Fianna Fail won 15.8% of the first preference votes cast in the local election contests across the Dublin region, in stark contrast to the 29.7% share of the vote won by the party in the Connacht-Ulster region (and the 28.1% won in Leinster and 26.4% won in Munster). 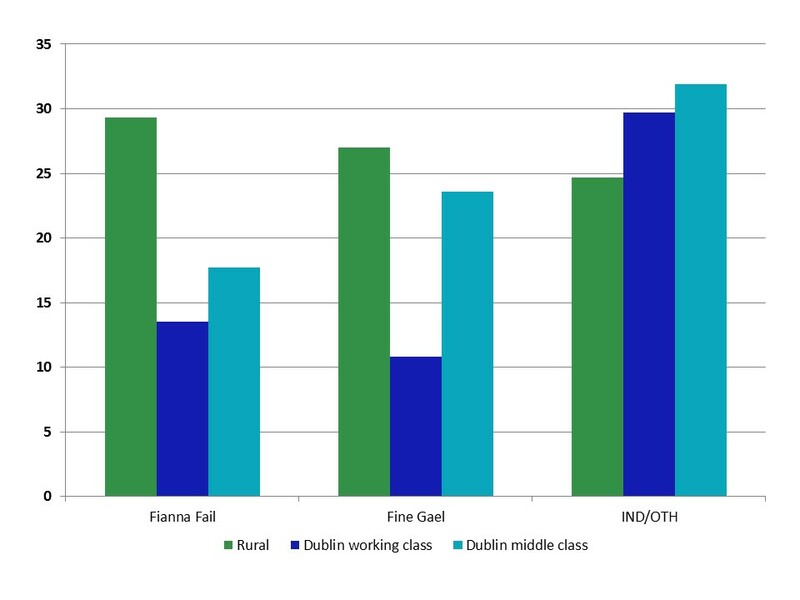 Within Dublin (as Figure 3) shows, Fianna Fail polled notably stronger in the more middle class constituencies. At an electoral division level, Fianna Fail could only win 4.9% in the (Dublin) North Inner City electoral area – a constituency that they had won 3 out of 5 seats in at the 1999 contests – and the party also failed to reach the 10% support level in Tallaght-South (6.8%), Lucan (8.7%), Ballyfermot-Drimnagh (8.7%), Waterford City South (9.6%) and Balbriggan (9.8%). That said, they did succeed in winning seats in most of these electoral areas (with the exceptions of Tallaght South and North Inner City). Indeed, it could be argued that Fianna Fail in Dublin were amongst the main beneficiaries of the boundary changes made by the 2013 Local Electoral Boundary Committee Report – namely the increased number of seats apportioned to the Dublin region and the overall increase in constituency size in that region – despite Micheal Martin’s accusations of “gerrymandering”. Their overall number of seats in Dublin increased from 18 (at the 2009 elections) to 29, despite the party’s share of the vote having fallen from 17.1% to 15.8% between those two contests. While the party share of the vote nationally was almost exactly the same as at the 2009 Local Elections, it was 1.4% lower in the Dublin region but 0.7% higher in the Connacht-Ulster region. That said, as Figure 4 shows, there were notable difference within the Connacht-Ulstert region. While Fianna Fail support fell in Monaghan and Donegal, notable gains were made in Cavan and most of the counties in Connacht. The party share of the vote in Leinster was exactly the same at both the 2009 and 2014 Local Election contests, while it was just 0.1% lower in 2014 in the Munster region. At a county level, the biggest improvement by far between the 2009 and 2014 Local Elections came in Kilkenny where the party vote increased by 11.1%, with the next best vote increases at a county level being associated with Roscommon (6.1%) and Cavan (5.8%). The party vote also increased both in Cork City (4.3%) and Cork County (3.5%). The party vote actually fell relative to 2009 in eighteen of the thirty one local authority areas, with the biggest drops in support at the local authority level being associated with Monaghan (6.7%) – although the Ballybay-Clones contest has still yet to take place there – Tipperary (5.4%), Kerry (4.7%), Louth (4.7%) and South Dublin County (4.1%). This entry was posted in by-election, Dublin, European Elections, Local Elections 2014 and tagged 2009, 2014, Constituency size, Fianna Fail. Bookmark the permalink. interesting analysis from a Fianna Fail prospective. I was interested to hear one commentator describe these new councils voted in as ‘lite ‘compared to what we had.